Inflammation of mucosa caused by cancer-treating radiation. Mucositis is to mucosa as dermatitis is to skin. This inflammation appears reddish with patches of greyish superficial necrosis or ulceration. Typically, radiation mucositis fully resolves four to six weeks after the last radiation treatment. Patient with vocal cord carcinoma, primarily of the right true cord (left of picture). This is before radiation therapy began, so there is not yet any radiation mucositis. One week after the end of radiation therapy. The tumor has disappeared. Radiation mucositis is evident from the patches of grey (arrows), which are superficial ulceration. Almost four weeks after the end of radiation therapy. 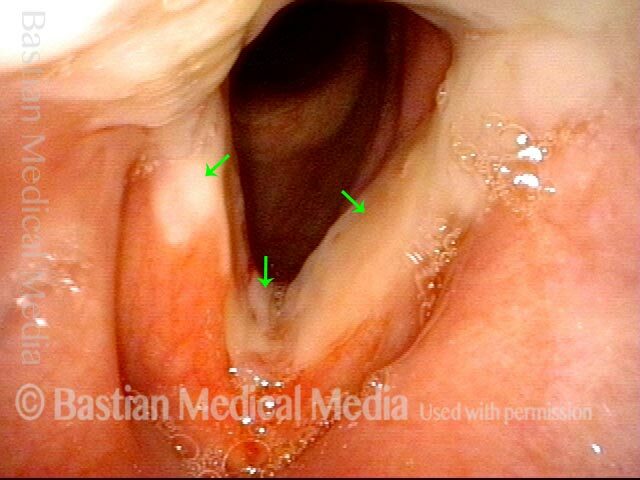 Note that the mucositis has begun resolving, especially on the right cord (left of picture). Almost ten weeks after the end of radiation therapy. The mucositis is virtually gone.